Constructing a chronolgy of release for Mattel's Shogun Warriors action figures PART 3: THE END OF THE RODAN! In 1977 and '78 Mattel introduced and developed the Shogun Warriors as a toyline of robots in three basic size classes-three inch tall figures, five inch tall figures and 23 1/2 inch tall giants. Rounding out the line was a handful of vehicles and perhaps the most famous Shogun, who was not a robot at all but the jumbo sized Godzilla. With the Shogun line's foundation in place Mattel would introduce new figures and vehicles but no new assortment types in 1979. 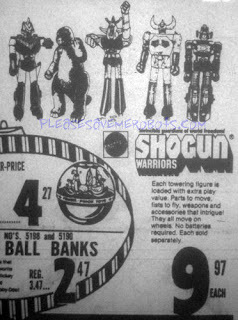 Unfortunately retailer interest in the line was dwindling as evidenced by the smaller number of Shogun newspaper ads in '79 compared to previous years. A few ads from '79 feature the giant Daimos alongside the other jumbos but I've never found a newspaper ad from that year showing any other new figure or vehicle. 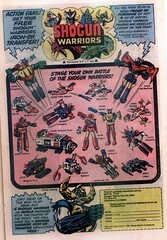 There was a mailaway promotion in issue 10 of the Shogun Warriors comic (and presumably every other Marvel comic with a November 1979 coverdate) that is the only place I've ever seen line art of some of the new 1979 figures and vehicles. I haven't found a figure or vehicle assigned product number 2989. Gaps in product number sequences are not unprecedented in my research-I ran into the same situation with the Zargon and the U-Combine Combatra numbers from 1978. However, if 2989 is truly an unused product number and not just a hole in my research, and given how the new additions are grouped together by type, I'd say 2989 was meant for either another giant figure or a vehicle. Could 2989 be the number Mattel intended for a US release of the 24 inch giant Grandizer? Or if 2989 was a vehicle could it have been the Mattel release of the Popy GA-37 DX Grandizer set with the five inch Grandizer? Both the jumbo figure and the Grandizer Saucer saw release in Europe (scroll down about 3/4 way to see the euro saucers here) but no proof of a US version has popped up yet. I'm pretty sure 2989 wasn't just the 5 inch figure by itself because there were no product number additions to the five inch assortment and the new 2-in-1 product numbers fit sequentially between the new vehicles and 3 inch Collectors Series. Of course I may be interpreting all of this wrong but at least that's where I'm coming from. Unless someone who worked at Mattel comes forward we'll never know. Now let's look at the new product numbers in the context of the assortments they fit in during 1979. 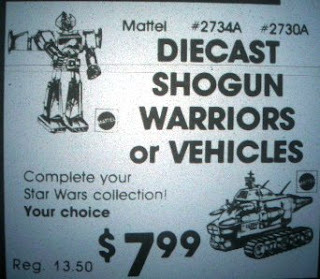 It's my belief that the line was canceled in 1980 and none of the Shogun Warrior branded products shown in the 1980 catalog ever shipped that year. The majority of the assortments from 1980 looked to be unchanged carryovers from 1979 so I'll discuss those here, too. The 3 inch Collectors Series got expanded with the addition of four new figures in 1979. Interestingly enough the 1980 catalog states that there were 12 figures in assortment 2518 but only 10 are pictured in that year's catalog pages. Was that a mistake or did Mattel intend to have two more three inch robots made? It's a little strange that Raydeen and Daimos appear multiple times in other assortments but never at the three inch scale. Could they have been planned but never produced? Years later when Bandai would re-release these toys as Mini GoDaiKins no new molds surfaced so it may be that the mention of twelve figures in the 1980 catalog was a typo. The same 4 figures carried over from previous years for 1979, but this assortment is not shown in the 1980 catalog. If the stand alone Popy GA-37 Grendizer were to be introduced as a Shogun it would most likely have fit here among the regular five inch series since it had no real transformation. Daimos and Voltus V join the 2-in-1 assortment in 1979, which is odd because Daimos is not identified as a TWO-in-ONE figure anywhere on his packaging and has no transformation ability so his inclusion in the TWO-in-ONE assortment is rather dubious. The '79 Mattel catalog even acknowledges Daimos' lack of transformation by describing the 2730 assortment as "Four Two in One defenders, plus Daimos". Perhaps at 5 1/2 inches it was Daimos' size that prevented him from being included in the standard 5 inch packaging. This assortment is missing from the pages of the 1980 catalog. Vehicle assortment #2734 carried over from 1978 with the additions of Daimos truck and the Liabe. Dragun was dropped and replaced by Daimos in the giant figure assortment for 1979. The 1980 catalog showed a change where Godzilla would no longer be part of the Shogun mixed assortment and instead move off into individual cases as part of the World's Greatest Monsters series. The only problem is that no Godzilla has ever popped up in World's Greatest Monsters packaging, leading me to believe much of the Shogun Warriors product line from the 1980 catalog was never released. Assortments 2901, 2902 and 2903 don't follow the usual Mattel pattern of having the assortment number be sequentially after the last item's product number. I have my suspicions about where these fit but I don't have even the slightest bit of circumstantial evidence to back it up. It would be easy to say they came out in '79 but I have no real proof of that. They don't appear in the Mattel catalog and I've never found ads for them. The 2903 assortment apparently got the Rydoto added to it at some point so I'd assume it was out for a while during the life of the line. The release timeline of these remain a mystery to me. Assortment 1681 appears in the 1980 Mattel catalog but no examples have ever surfaced and they are largely regarded as being unproduced items. Were it not for Rodan's inclusion in the comic book ad mentioned at the beginning of this post I wouldn't consider him a Shogun Warrior. Yet there he is at the bottom of the mailaway iron-on patch alongside Godzilla. Rodan is the only Shogun Warrior-related figure I have ever found an ad for in 1980 newspapers. I have never found any actual Shogun Warrior branded action figure ads after 1979. In my next post I'll take a look at the circumstances surrounding the end of the Shogun Warriors toyline and see what evidence exists to support the varying theories about its demise. 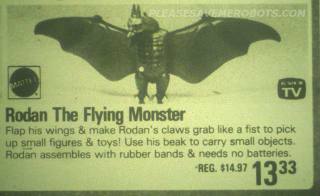 I had Rodan when I was a kid. He was awesome. One day I will have him again! This is a seriously ambitious project, EKM. The robotarded thank you! Thanks for recognizing that. The list is only a couple paragraphs over two blog posts but I couldn't believe how incredibly tedious and exhausting it became over the two weeks it took to write it. It burnt me out on my hobby a little and I'm glad real life takes over for a couple weeks. I can't imagine how much effort whole books on these subjects take. Toy robots journalism is no joke! I'm also glad I did it if for no other reason than at least my take is out there. Now anyone who wants a more reasoned answer than just "they came out in 1979" has another point of view to read. Hopefully whoever reads it in the future will see Shogun Warriors less as a big mess and more as a organized series of releases on an ambitious scale. But probably the greatest benefit to come of all this is that I finally have an understanding and appreciation of that table Nala took a picture of at the Columbus toy show a couple years back. The one who learned the most out of all this was me and now when I see Shogun Warriors ships and robots and monsters at a toy show I'll really know what it is I'm looking at.